Loaning money, more so, to a family member or friend can be a taunting task. It goes without saying that money can cause problem and can solve all your problems in equal measure. Due to this, financial entanglements often ruin relationships with family and friends. This is the reason why most financial experts advise against loaning a family member or friend. After all, you don’t have any guarantees that you are going to have your money back. 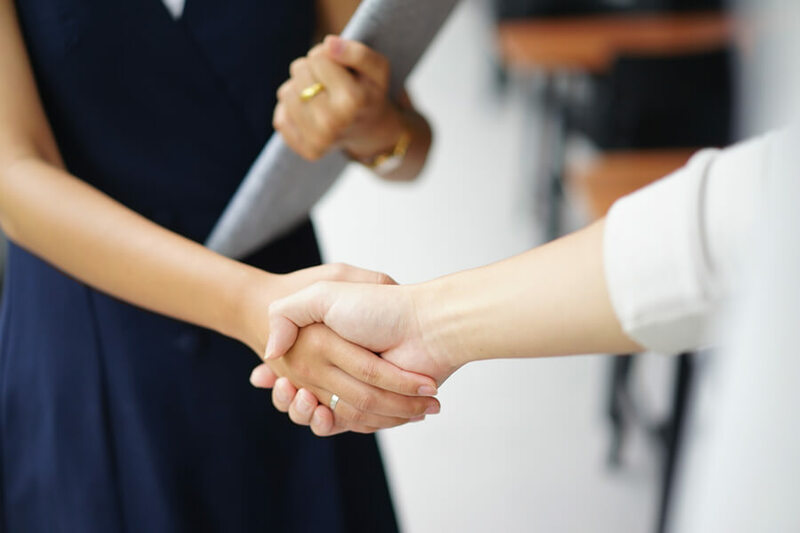 However, there are strict, yet helpful measures that you can take in a bid to help your family member or friend out of a difficult financial situation without ruining your relationship with them. 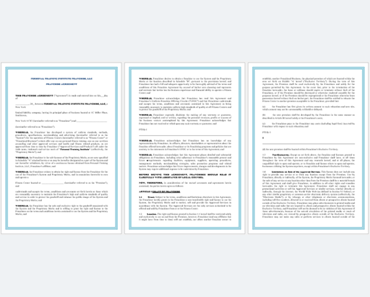 Family Loan Agreement is a legal binding agreement between two family members that clearly spells out the terms of lending money to a family member with an aim or being paid back after a given duration of time with an accrued interest. 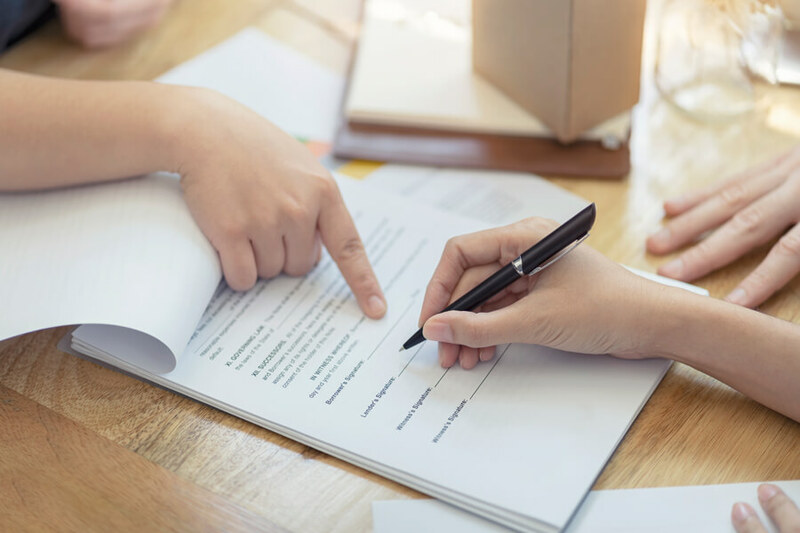 This agreement can also apply to lending money to close friends with an aim of getting back your money with an interest after a certain duration of time. It’s of utter essence however to note that family loan agreements are totally unsecured since the person borrowing the money is a family member or a close friend. This is to say that there are no assets taken as collateral incase the family member fails to pay back the money. 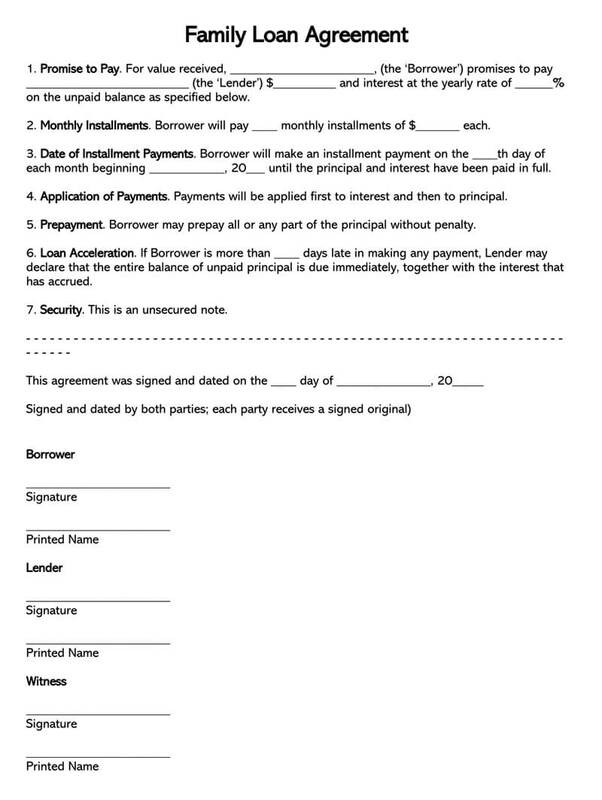 So, how will you be able to collect back your money if the family member or friend defaults on the agreement? Well, the only solution that you will have is to go through a legal action or through a small claims court. This way, you can be assured to get back your money from the family member legally. As stated before, lending money to a family member or a friend can prove to be a daunting task. For this reason, it’s important to be clear on what the repercussions are. Before starting the process of lending the money, here are things you should consider. Find out what the problem is. Are there any other ways in which you can help apart from financial support? You should keep in mind that money isn’t always the solution to all problems. Consult your family member or friend on whether you can help in any other way apart from loaning money. 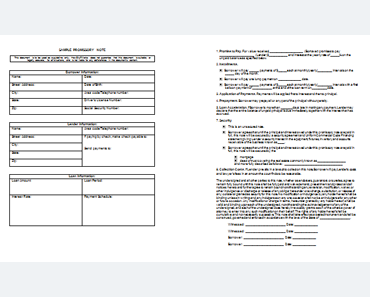 Can you afford to lose the amount requested? As a general rule while offering loans. You should only lend the amount that you can afford to lose. You should not go out of your way to break the bank on money you had saved for your college fee. You should draw up a formidable payment plan and a loan schedule that works for you. If your family or friend doesn’t agree with the schedule, then don’t lend the money to them. 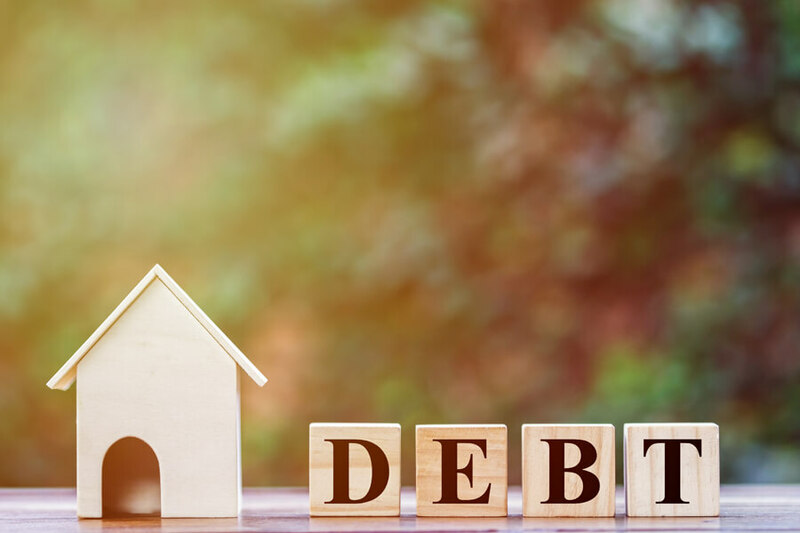 Even though interest rates may clash with the initial intention of offering the loan to a family member, they are a necessary evil to maintain professionalism. First of all, just like any other institutions, you will be doing your money a favor by charging an interest rate since it could have earned a decent interest if it could have been use in a different manner. This way, you will be able to offset any losses that may occur during the loan period. 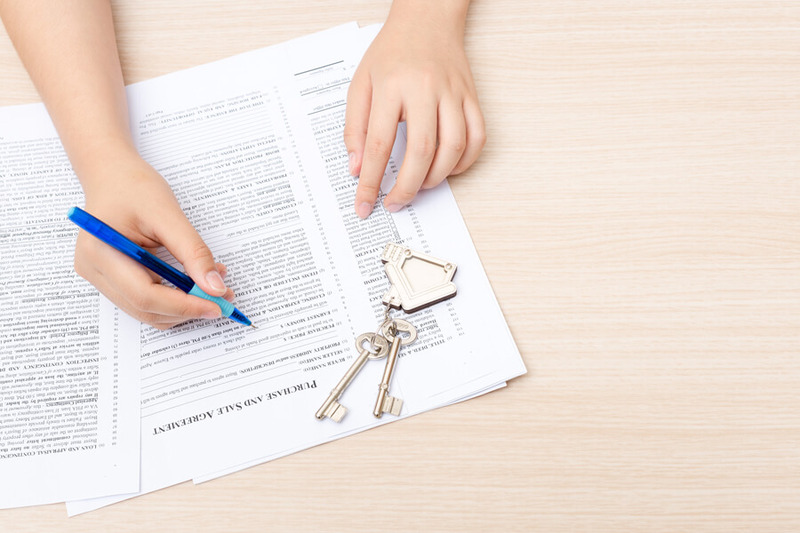 However, it’s is important not to set loan limits above IRS threshold limits. This is because you will be required to pay a tax fee once this threshold is reached. To avoid this, utilize the applicable federal rate that is offered directly by the government. This will not only ensure that you get a decent interest rate but also, you will not be subject to any form of taxation. 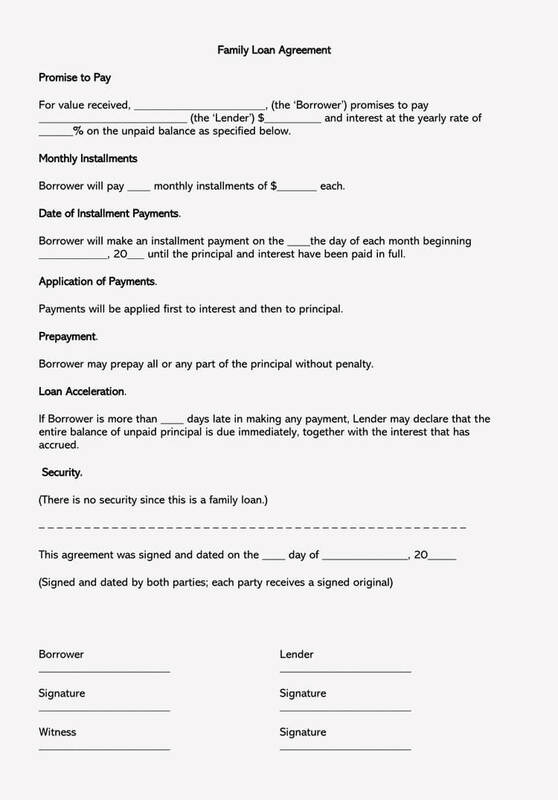 Terms of repayment i.e. monthly, weekly, installments or lump sum. For value received, _______________________, (the ‘Borrower’) promises to pay __________________________ (the ‘Lender’) $__________ and interest at the yearly rate of ______% on the unpaid balance as specified below. Borrower will pay ____ monthly installments of $_______ each. 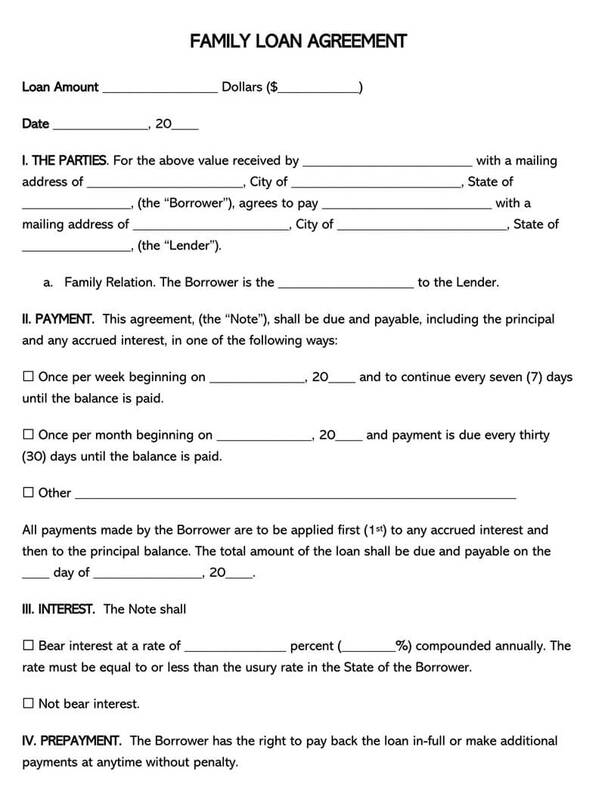 Borrower will make an installment payment on the ____the day of each month beginning ____________, 20___ until the principal and interest have been paid in full. 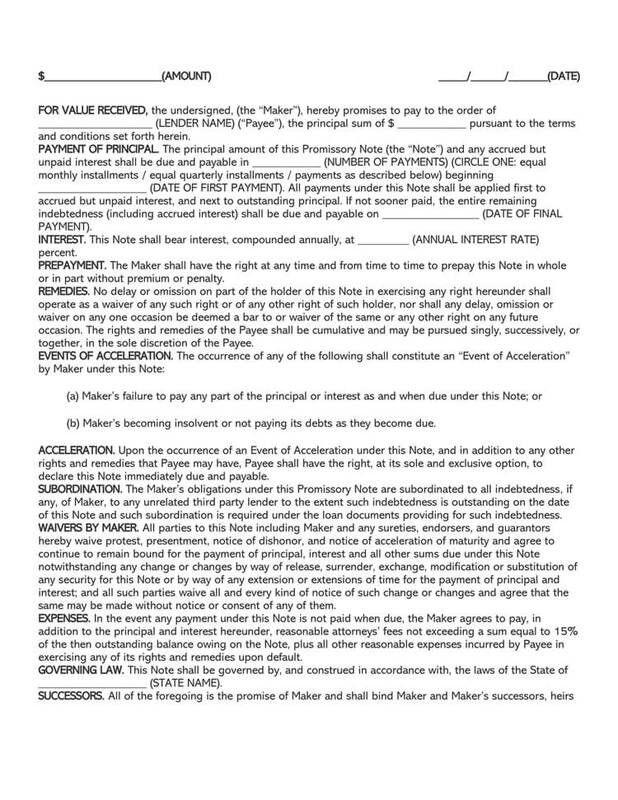 Borrower may prepay all or any part of the principal without penalty. If Borrower is more than ____ days late in making any payment, Lender may declare that the entire balance of unpaid principal is due immediately, together with the interest that has accrued. One of the most overlooked areas of family loan agreements is tax implementation. This is because most people either neglect or are ignorant of the fact that family loans also attract tax due to interest incurred. Its therefore of utter importance for individuals to loan amounts that do not exceed the IRS tax threshold.